Our family loves sports, but contra dancing has replaced many of the sports we used to play as our preferred recreation. Even though both Jim and I grew up golfing, I haven’t played since my back surgery 15 years ago. 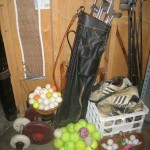 I’m giving away my old clubs, tennis and golf balls, weights, and the extra ping pong net. 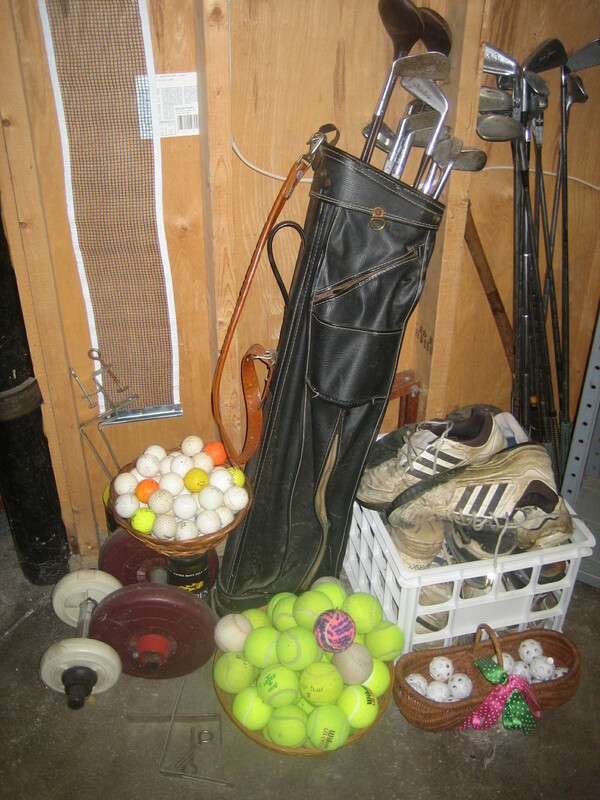 (I’m not giving away Jim’s golf clubs, the bike rack and pump, 5 tennis rackets, basketballs, and the volleyball net – most of these are not mine to pitch.) We also have a crate of old tennis shoes that Jim has been saving because he heard you can recycle them. My contribution to this effort was to find out where to take them since they were not in good enough condition for Soles4Souls. Check out Run the Planet, NikeReuseAShoe, and Ecocycle.